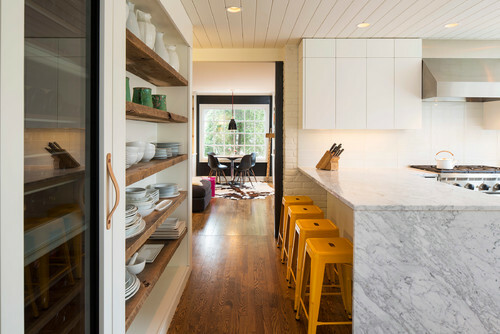 Have you considered having open shelving in your kitchen? Unless you have been living under a rock, you know that open shelving has become the “thing” to do. 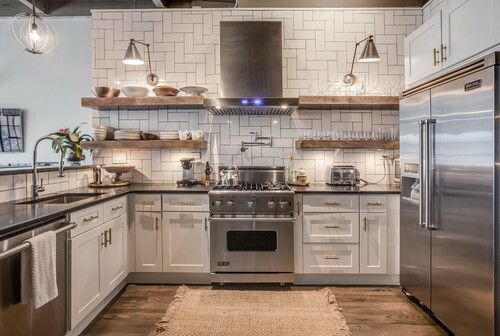 What with HGTVs Fixer Upper using them quite frequently to achieve Joanna’s signature farmhouse look, and the rise in popularity for the Rustic Industrial look, open shelving seems to be just about everywhere. But before you take that leap, let’s look at both the Pros and Cons of this design choice. 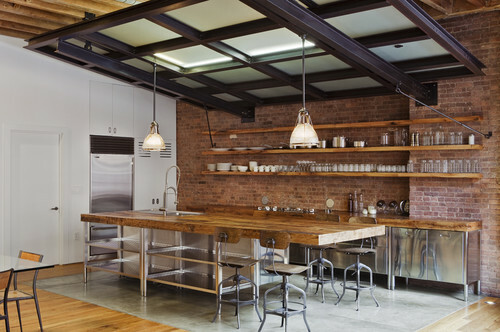 Probably one of the biggest reasons for people choosing open shelving is because they are very trendy. They look incredibly good with both the farmhouse chic and the rustic industrial design styles, but can work with just about any design choice. Another great reason to choose open shelving is because of their very modest cost. 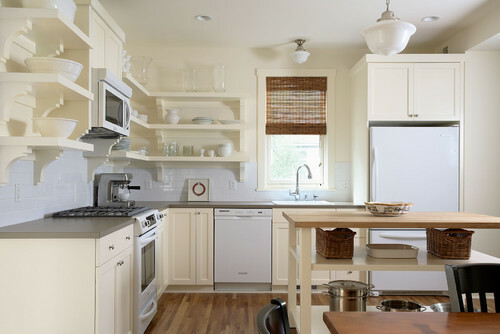 If you want to remodel a kitchen, but a full set of cabinets just isn’t within your budget, this is a great option for getting the most bang for your buck. Floating shelves run just a fraction of what it would cost to install cabinetry. Plus, they are one of the easiest DIYs out there. So, you can save money on labor as well. If, on the other hand, you already have upper cabinet, but you are still needing some extra storage space, open shelving can be added to those areas where a full sized cabinet may not fit. Sometimes, a person just likes the idea of showing off a beautiful display of dishware. After all, if you paid a lot for, or did a lot of searching to find gorgeous pieces, why not show them off? Although you probably will know exactly where everything is located in your kitchen, regardless of whether or not it is hidden behind doors, exposed dishware can make it very easy on guests. This can come in handy if your in-laws visit frequently, or if one will be moving in sometime in the near future. 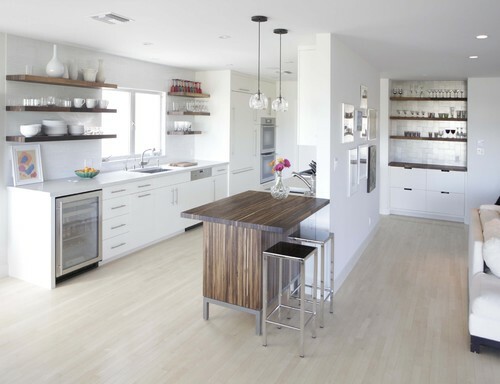 With open shelving, there is no need for them to search through cabinets looking for a coffee cup. Everything that they may need can be located just by scanning the shelves. Despite the trendiness of this design, it definitely is not everyone’s cup of tea. This is something that probably doesn’t matter unless you are looking to put your home up for sale in the future. In which case, you may want to consider the overall design and what your particular market is like. 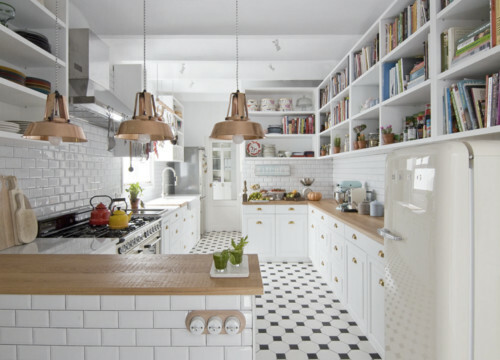 Although open shelving can look very put together and chic, with the wrong set up (or too much dishware), you run the risk of ending up with more of a cluttered look. 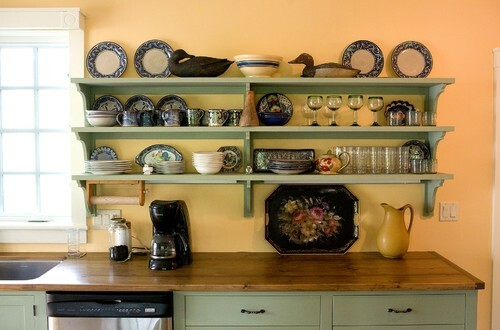 So, if you like the look of open shelving, and you are concerned with achieving a neat and attractive look, check out how others have set up their dishes. Ok. So, this one is the big one for me. I absolutely hate the dust that collects on open shelving. Now, this may not be an issue for you. You may not mind cleaning off your shelves when they need it. However, maybe this is something that you haven’t even considered. In which case, I tell you to think about it. Imagine all the dust that collects on the surfaces in your house right now. Now ask yourself “How long will my dishes sit out in the open before they cycle through being used?” If it is a long time, you will need to wash them regularly to keep them clean. 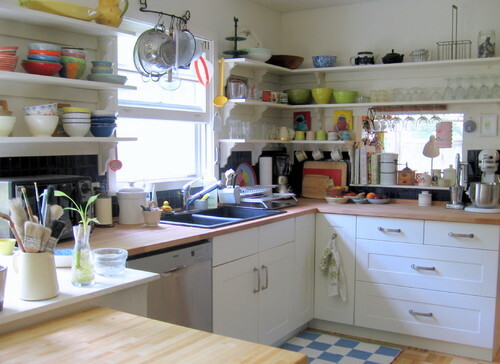 If you still want to use open shelving, maybe consider just displaying the dishes that will get used daily. Thus, keeping them from having time to collect dust. But, still know that you will need to dust the shelves right along with the rest of your furniture, anyway. Now that you are aware of the Pros and Cons of open shelving, I hope that you are better able to decide if this design choice is for you. If you can think of any others, please let the rest of us know in the comment section below. I always enjoy hearing what you all have to say!